1. Live Green. Save Money. Chances are, you do not use every room in your house the same amount every day. So why are you heating your home as if you did? A central furnace cycles on and off several times an hour and heats your entire house, even unoccupied rooms. This leads to a lot of wasted money and energy. Rather than heating every room equally in a wasteful, inefficient, and expensive manner, gas fireplaces offer a green alternative. They offer zone heating, an efficient method of providing heat to where and when you need it. They add to your home’s comfort while at the same reduce overall fuel consumption. According to a study on Energy Efficiency in Buildings, Zone Heating solutions can provide energy savings of 20-40 percent. All you have to do is turn down the central thermostat and let the fireplace heat where you live. You will live a much greener lifestyle. And you will save a lot of money. Modern Gas Fireplace with Chrome log holder. 2. No need for a chimney. Want a fireplace but worried about the hassle and expense of installing a chimney? With the recent advances in fireplace technology, you won’t have to. Not only will you not need to install a chimney, but you also won’t have to pay for expensive modifications for your home. With direct vent gas technology, the fireplace is vented to the outdoors via a single pipe that runs through the side of the house to the outdoors, drawing air needed for the fire and expelling its byproducts. This kind of gas fireplace can be added for as little as $3,500, including installation. Ventless gas technology is even simpler, without the need for a chimney or any external pipes. The fireplace takes care of itself. 3. Already have a chimney? Easy to convert. If you already have a masonry-built wood burning fireplace, you are not stuck with it. You can easily update to a gas system. Simply use a gas fireplace insert. Conversion is easy and can be completed within a few hours through professional installation. Updating your fireplace in this way can increase energy efficiency dramatically and add considerable warmth to your home. 4. Control the heat and flame. Tired of how wood-fireplaces often wax and wane in warmth and light? 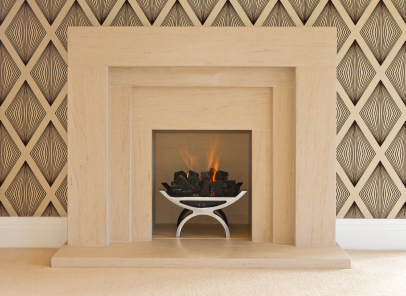 Tired of adding wood to the fire in a vain attempt to get the right temperature and flame? Gas fireplaces eliminate this problem entirely. Many units can be thermostatically controlled, just like your central furnace. As well, some models allow you total control over not only the heat, but also the height of the flames and the intensity of the embers. You can now have complete control over the warmth and ambiance of your fire. All of this through the touch of a button on a remote. 5. There are countless styles of fireplaces perfect for your home. From the rustic country style fireplace to the more sleek and contemporary, there is a huge variety of styles available to fit the style of your home. Whatever style you prefer, you are not stuck with limited options. A fireplace is not just a highly efficient functional heat-source: it is a centerpiece addition to your home which will greatly enhance its beauty and worth.